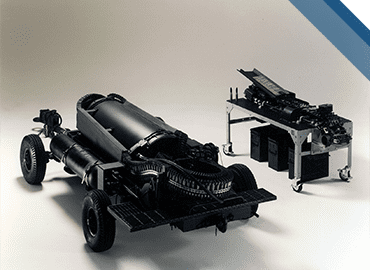 The self-contained 20mm Universal Ammunition Loading System significantly reduces the time and manpower required to load all U.S. Air Force, Navy and NATO aircraft equipped with internal M61A1/M61A2 20mm Gatling gun systems. UALS consists of two sub-systems: a loader and a replenisher unit. The UALS loader transfers ammunition into the aircraft’s weapon system. External drive power is supplied by a GFE manual hand crank or by a self-contained pneumatic supply carried on the UALS. The pneumatic air cylinders can load up to three full UALS complements. A UALS replenisher is capable of accepting 20mm bulk (loose) or linked ammunition while simultaneously receiving and sorting spent cases and unfired rounds. It also strips ammunition tubes.